Get Away to an unspoiled environment, a place that has been virtually untouched and unspoiled, that is Beaver Island. Our cabin (Kelly's Point) is situated 40 feet from Lake Michigan on a 2 acre Parcel. The views of Lake Michigan and The Fox Islands are spectacular! Getting to Beaver Island: The first stop is Charlevoix, MI, a Lake Michigan harbor city located approx 250 miles north of Detroit. You can also fly into Pelston or Traverse City airports and connect to Beaver Island Ferry or Island Airways in Charlevoix. From Charlevoix take a quick 20 minute flight or the 2 hour leisurely ferry ride on the Emerald Isle. Either way, it's an amazing adventure! When you arrive on the island you will find a place that will take you back in time. Slow, patient, friendly and Beautiful! You might want to stop at the Shamrock for a beverage after the ferry ride or take the scenic 20 minute drive straight out to Kelly's Point. Distance is measured by time on the Island, most of the roads have not been paved...it's just another way to make you slow down! When you reach Kelly's Point the drive in is through a wooded pathway into a vast open area with scattered trees along the perimeter. 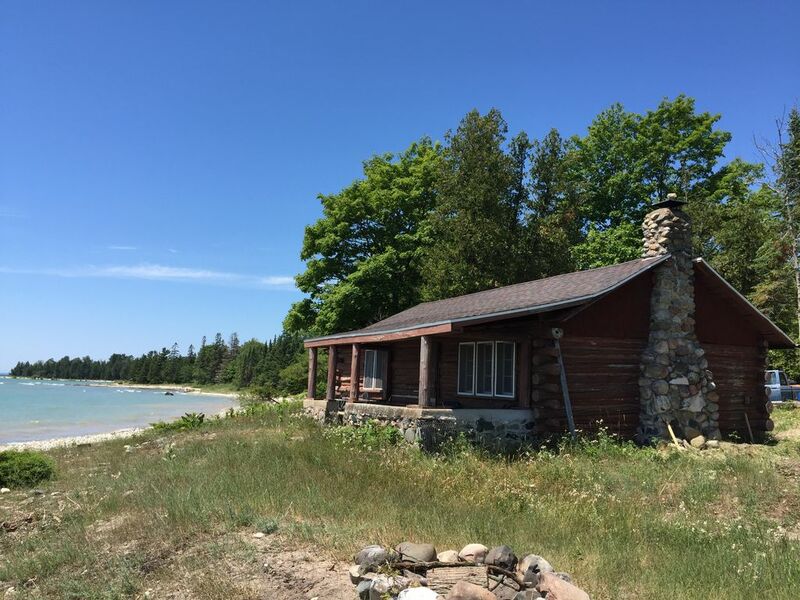 Kelly's Point was first built in the 1930's as an original island cabin. It is in the process of being modernized, There is a functioning indoor toilet, outdoor shower, kitchen sink and electricity. Kelly's Point is very charming, with spectacular views of Lake Michigan. It is 900sq. feet, has a great front porch, and a wonderful beach. All furnishings are new or local antiques. It is the renter's responsibility to bring their own sheets and towels. Kelly's Point has a charming decor with an open layout which includes 11 windows, overlooking Lake Michigan. There is one bedroom with 2 single beds. It is a perfect get away for 2 people! You may enjoy a good book overlooking Lake Michigan, walk the miles of sandy beach which are clear, pristine and unobstructed, take a swim in the clear lake water, explore the island and over 100 miles of roads, fish on one of the 5 inland lakes, roast marshmallows in the fire pit on the beach, admire the vast array of stars, discover some of the other islands in the Archipelego, visit the spa for a massage, play nine at the Beaver golf course, lounge on the patio, cocktails at Nina's, Donnegal Bay to enjoy the sunset, visit the CMU Biological center, or the 2 lighthouses on the island, Little Sand Bay, Iron Ore Bay or simply do Nothing! This is a vacation you will never forget and leave feeling truly rested. Bathroom has a toilet and bath sink, shower is outside. Most beautiful beach on the island. Just blankets. Bring your own sheets and towels. Great working fireplace with some wood provided. There is a functioning kitchen with a Coleman stove,refrigerator and microwave, coffee pot and kitchen sink. If you want to visit the island and have a authentic experience this is your place! Listening to the waves as you fall asleep or read a book is the best part. Make sure to bring a flashlight because a storm can put the power out on the island, luckily they had plenty candles! Thanks for your stay Karly! I fell in love with Lake Michigan while staying at this cabin. Leave your cell phone at home and sit on the back porch for entertainment. The cabin sits so close to the lake that you feel like you are part of it. We did lots of swimming, snorkeling, and bird-watching ....it is a back-to-nature kind of place. The beds were comfy and for the best experience, open the windows and listen to the lake while you sleep. Truly amazing. We made most of our meals on a coleman camp stove, but we ate out a few times. Our favorite happy hour/dinner place was the Circle M restaurant. There is a lot of good food to be found on the island. And don't forget your flashlight. Lighthouse is nearby, lots of great walking beaches right out the door of the cabin.